The Thunder have traded Carmelo Anthony to the Hawks, ending their short-lived big three experiment. He'll likely be boughtout and hit the free-agent market. 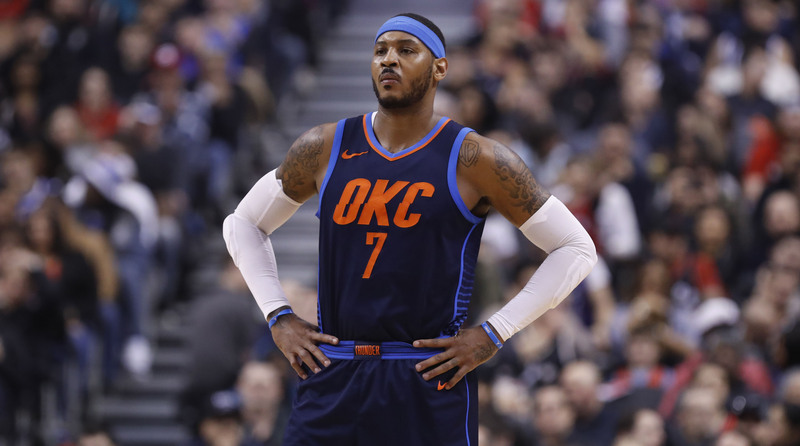 The Thunder’s Big Three experiment is over, as OKC reportedly traded Carmelo Anthony to the Hawks on Thursday in exchange for Dennis Schroder. As part of the deal, Mike Muscala will go to the 76ers, while Timothé Luwawu-Cabarrot will head to OKC and Justin Anderson will join the Hawks. The Thunder are also said to be sending Atlanta a protected 2022 first-round pick in the deal. The writing for Anthony’s departure has been on the wall since he opted into a $27.9 million contract for this year. Melo is expected to be bought out at his full salary and enter free agency. Schroder, once the Hawks’ point guard of the future, averaged a career-high 19.4 points per game last season. Schroder is a career 32% shooter from three, and has two years and $31 million left on his deal. Muscala, a stretch big, played in 53 games for Atlanta last year and is in the final season of his contract. Let’s grade the deal for each team. OKC didn’t have many suitors for Melo with cap space tight around the league. The situation had grown too toxic for the Thunder to keep him, and at least the front office wasn’t committed to a straight salary dump. The Schroder experiment will be interesting, however. He’s a ball-dominant guard who isn’t the cleanest fit on the roster. Schroder can anchor bench-unit lineups, but his lack of outside shooting will be an issue if he’s called on to close games. And as someone used to initiating the offense, the more Schroder plays with Russell Westbrook, the more potential for issues. Depth has been a problem for OKC at times, so not purely dumping Melo for no one is somewhat of a win. Luwawu-Cabarrot is an athletic wing and not much else at this point. The 2022 pick is reportedly lottery-protected, and will turn into two second-rounders if it doesn’t convey that year, so it’s not really an important part of the transaction. The tax bill is the tax bill, and if Clay Bennett wants to pay $100 million or $500 million for this roster, it doesn’t really matter, unless the Thunder eventually decide not to pursue or keep someone because of money. The Hawks are rebuilding this year, and there was no room left for Schroder on the roster after drafting Trae Young and trading for Jeremy Lin. Getting rid of Schroder for an expiring deal is fine considering the state of the roster. While it’s never ideal for a team to have to essentially give up on a first-round pick, the Hawks’ new front office deserves at least some credit for not hanging on for too long and cutting the cord as necessary. Any move that opens up more opportunities for Young is a good one. But Atlanta’s not receiving much more than that in this deal. Philly snuck into this deal to pick up Muscala, and that’s not insignificant after the Sixers were spurned by Nemanja Bjelica. Muscala should offer some of the outside shooting that Ersan Ilyasova did down the stretch of last season, and he can soak up a decent number of minutes in the frontcourt. The pickup probably won’t move the needle come playoff time, but it’s a worthwhile acquisition for Philly.